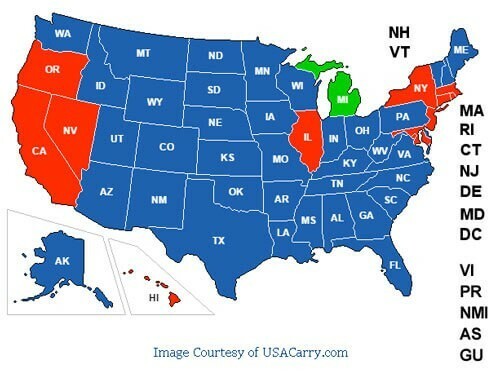 As a Michigan resident with a valid CPL, are you allowed to carry in other states? A Michigan concealed pistol licensee who wishes to carry a concealed pistol in another state is responsible for complying with the laws of that state. Michigan’s concealed pistol law expressly recognizes permits issued by other states to its residents. MCL 28.432a . Non-residents are subject to the Michigan law while carrying a pistol in Michigan, including those laws restricting where pistols may be carried, the implied consent provision, disclosure to a peace officer when stopped, and carrying while under the influence. A non-resident should acquaint himself or herself with the Michigan law before carrying a concealed pistol in Michigan. If you are a non-resident of Michigan with a valid concealed pistol permit from your home state, Michigan will recognize your permit. However, you must carry in conformance with any and all restrictions appearing on the permit. You are subject to Michigan’s concealed pistol law including but not limited to restrictions on where a concealed pistol may be carried. Please review the information provided on this website for further information. If you are a Michigan resident with a Michigan concealed pistol permit and want to carry your pistol into another state you are strongly encouraged to contact that state for information on their concealed pistol law. A Michigan CPL permit does not supersede any other state’s law or CCW requirements.